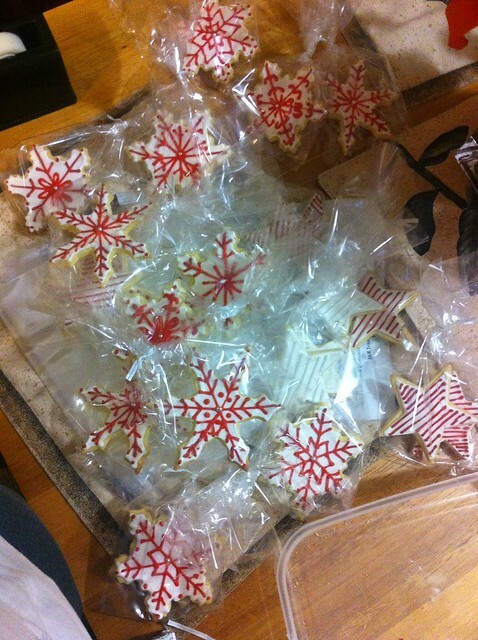 Every Christmas, at least for the past 5 years or so, I make a big batch of cookies, and package them up for my workmates. Last year I made Nicciolini, the year before that I made Lavendar & Lemon, and for a few years before that I made plain shortbread. This year I was confident enough to “invent” my own recipe, even though I’m positive its been done before. Enter Lemon Shortbread. 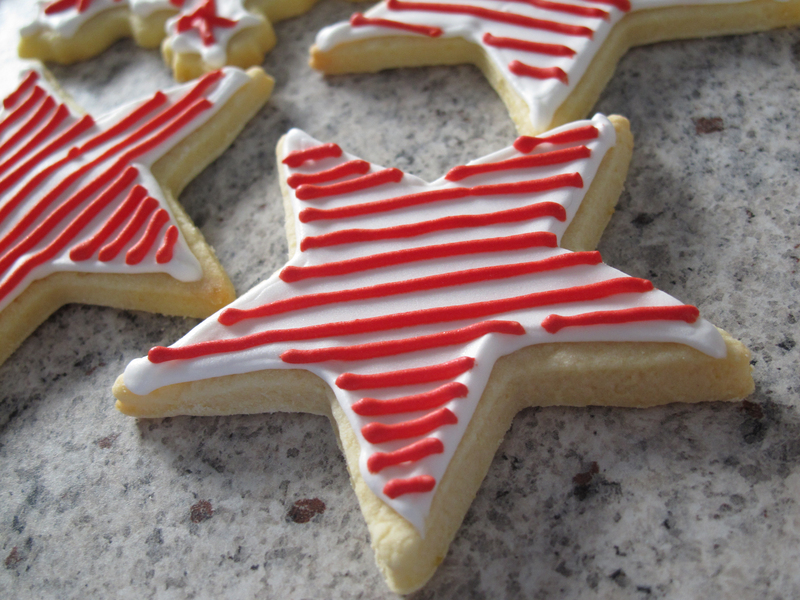 These were by far the most successful shortbreads I’ve ever made. Successful in that they kept their shape perfectly during baking, even the most intricate shapes. The cooking time I chose was spot-on, even though it was a number I literally picked at random. The dough was so easy to work with and didn’t deteriorate as it got warm. I will be coming back to this recipe again and again. *make sure, if you can, that they’re organic lemons, or get them from a home garden. I’d hate for anyone to ingest poisonous sprays with their cookies! In a stand mixer, cream butter and sugar together for about a minute. Scrape down the sides of the bowl to make sure all the butter is mixed in. Add the egg & egg yolk and the lemon rind, and beat until combined and smooth. Add the flour one large spoonful at a time, until all flour is incorporated. Scrape the sides of the bowl one more time and beat until mixture is smooth. Lay out a piece of plastic wrap, and pour out the contents of the bowl onto the plastic. Press the dough into ball and wrap tightly in the plastic. Refrigerate for several hours, the easiest though is to make the dough the night before you need it, as this gives the lemon the most time to infuse its flavours into the butter. Also, the dough needs to be quite cold when you’re working with it, as this is one of the factors that help the cookies hold their shape. Time to bake those cookies! Preheat fan-forced oven to 190 degrees Celsius. Find a smooth surface to roll out your dough onto, I did mine straight on my kitchen counter. Using a rolling pin, slowly roll the dough out until its about 3mm thick. (Two things – roll it out slowly to prevent the dough from tearing and forming odd shapes. Secondly: 3mm might seem thin when the cookies are cut out, but they do rise ever so slightly in the oven, and 3mm was the perfect thickness for my cookies. Do experiment with different thicknesses until you find one you like.) Start cutting out your shapes – I did stars, flowers, snowflakes and a bunch of mini shapes with the scraps. Place on baking trays lined with baking paper**, fairly close together (remember these cookies hold their shape really well) and bake for 8 minutes, or until the edges are just turning golden. The biscuits will feel soft when they are hot but will firm up once they cool. **I recommend preparing at least 4 trays with baking paper. 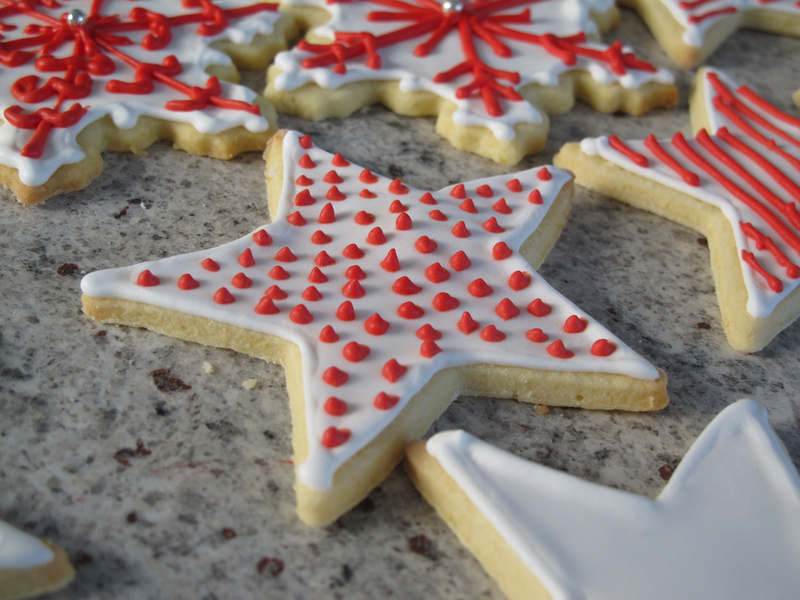 This way, you can bake 2 or 3 trays while cutting out your next lot of shapes. 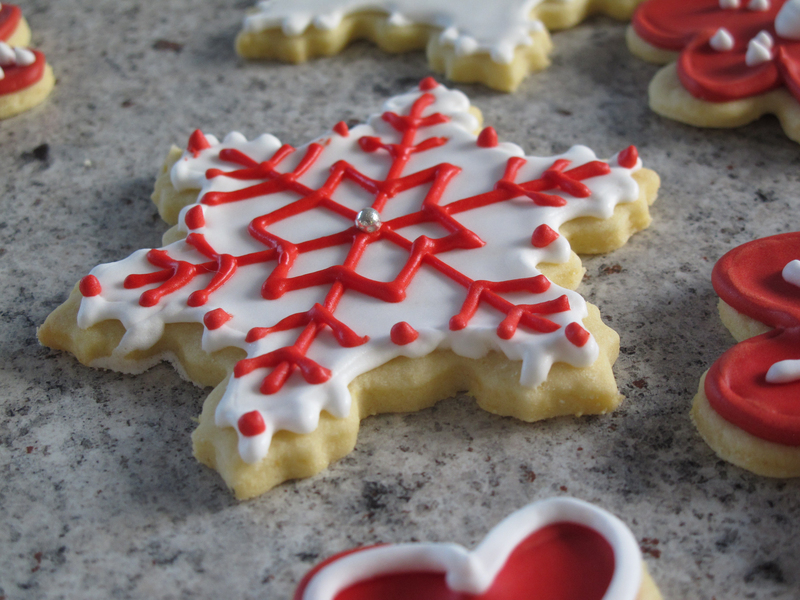 Once cookies are completely cool, you can now decorate them! There are lots of ways to do this. 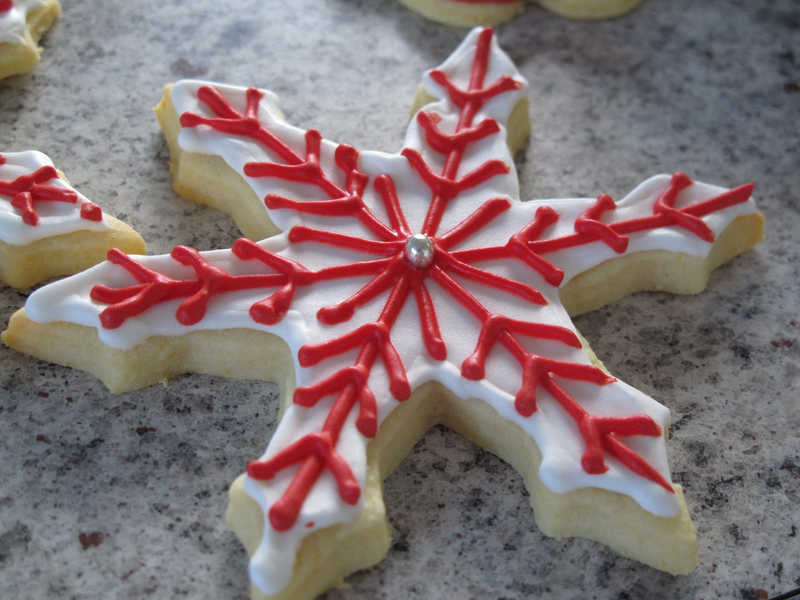 I used royal icing, but you could just as easily use a lemon sugar glazing, or simply dust with icing sugar. I made so many, and I don’t wat to bore you with thousands of cookie photos, so I’ll just show you some of my favourites! Merry Christmas to all my lovely readers, I’ll see you in 2012!! This entry was posted on December 24, 2011 at 8:44 pm and is filed under Sweets. You can follow any responses to this entry through the RSS 2.0 feed. You can leave a response, or trackback from your own site.